On June 29, FERC issued an order asking PJM to make significant changes to its capacity market. This order came in response to concerns from traditional generators about “state subsidies,” namely RECs and ZECs, suppressing prices in capacity auctions. PJM had previously offered two potential pathways for market revision (neither of which was supported by PJM’s stakeholders), but FERC rejected both proposals and instead initiated a new proceeding and offered a third path forward. FERC asked PJM to revise its capacity market, specifically its Minimum Offer Price Rule (MOPR), which sets a minimum bid price for new generation resources to prevent new entrants from submitting artificially low prices. FERC proposed to eliminate all exemptions from the MOPR, which would unfairly make these technologies less competitive in capacity market bidding. 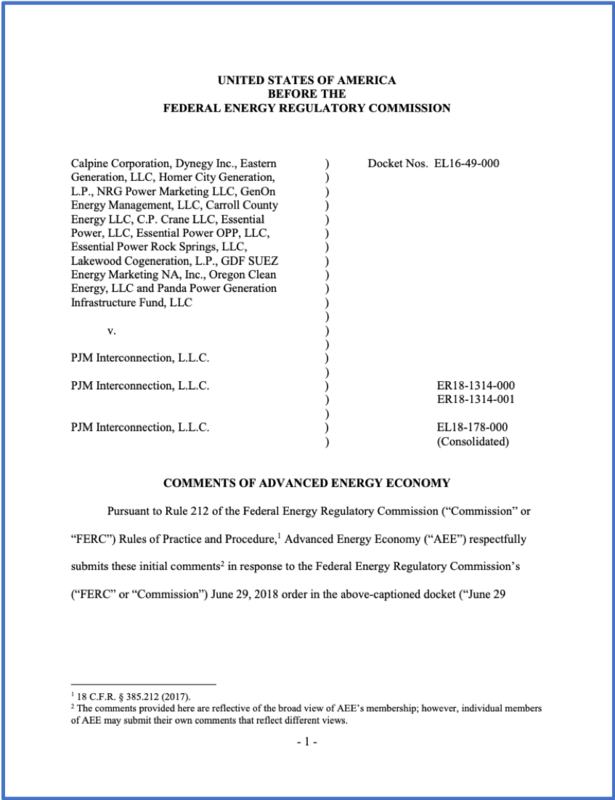 In comments submitted October 2, AEE voiced concern that an overly broad application of the MOPR, as was suggested in the FERC order, will create significant barriers for new advanced energy technologies. Please fill out the form to download the comments.